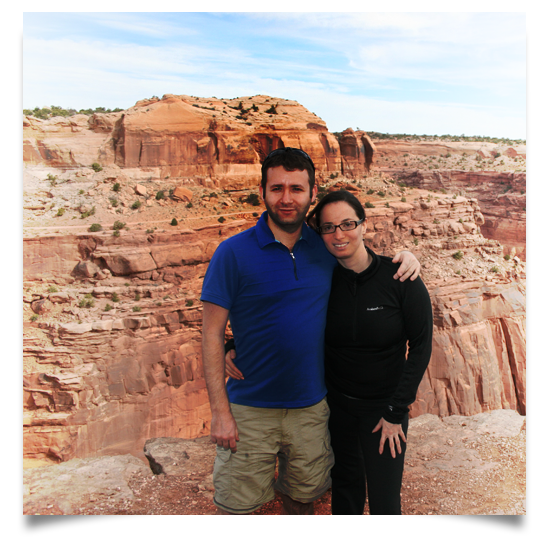 My husband and I just came back from a wonderful vacation in Moab, UT. New printables and projects are coming soon. I do my best to provide useful information and materials for my readers. I share most of my work for FREE. I try to answer all questions and reply to every comment. 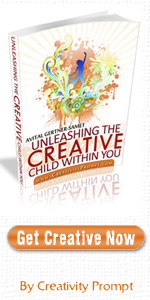 My only stream of income from my blog is my affiliate links to products I tried from stores I trust [from which I get a fraction of the amount paid] as well as my products – my workshops and my book. I love my readers and every time a reader comments on how helpful my printables are for her – it truly makes my day!!! I REALLY appreciate when ever you tweet, like, pin or stumble upon any of my posts. It means a lot to me when you share a link to a printable you used on a project. I always find it hard to recognize my printables, as your projects are so beautiful, that my design pales in comparison and shrivels in shame. Which is why it is hurtful when someone takes the time to pin something just to mention it isn’t for my actual work, but for a link I included on my post. And a way too sensitive one. 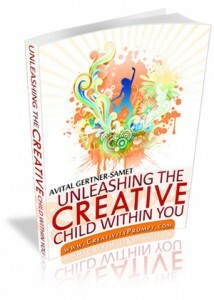 If you are not new to Creativity Prompt you are probably wondering why isn’t there anything new? 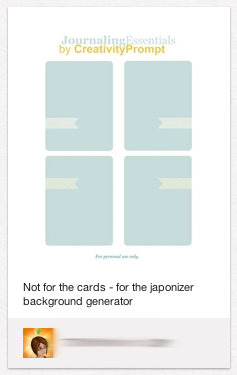 Why haven’t I made any new layouts, mini books, cards, etc. The truth is, I haven’t had the inclination to create anything physical, outside the boundaries of my computer, for a long, long time. I’m not sure what is it that holds me back. I have a ton of ideas. My brain is basically exploding. I have so many things that I imagine making and planning all the steps and registering in my mind’s eye all the supply I will need in order to make these incredible stuff. But when push comes to shove, I just don’t do it. But I just don’t do. 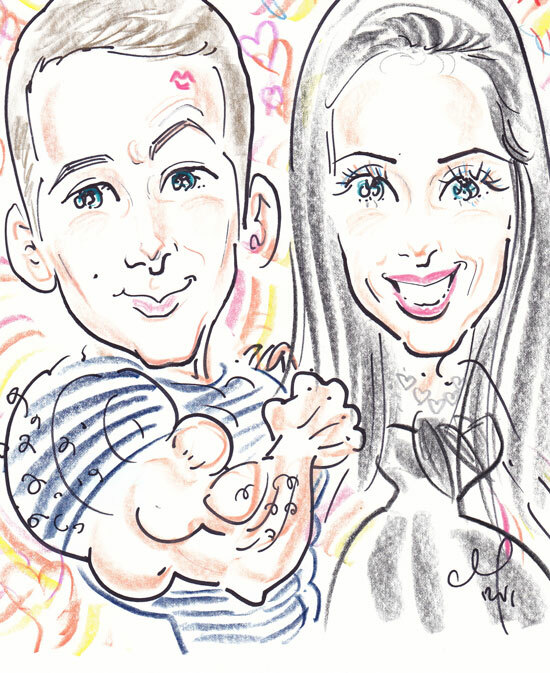 I uploaded a scan of a caricature of my husband and I that an artist made in a recent holiday party we attended because when I see the sparkle this artist put in my eyes, I feel ashamed. I feel that I’ve lost that sparkle. I cannot pinpoint the reason for my current disinclination. However I am pretty sure it has something to do with trying (and failing) to find a job as an attorney here, in California. When I left Israel, first to Ireland and later to California, USA, I had left a great job that I liked and I was very good at. Very, very good. After a few years of pursuing my artistic passions I longed to go back to practicing law. I missed the intellectual challenge as well as the look on my clients’ face when things worked out for them. I decided to study for the infamous California bar exam and lo and behold, I passed. Academics were never an issue for me, but I looked at it as a signal that I can do well even if it’s not in my mother’s tongue. My intelligence quotient seems to translate to English (It should, as after all, it is a number). Sadly, no one seems to give me a chance to prove it. I feel that from something I became nothing and it saddens me. A. Lot. I feel disappointed and even frightened that my move had severed my legal career. Today I stumbled upon an old inspiration prompt I posted a few years ago: “Today Is The Day“. I couldn’t have found it on a better time. Just before the new year and soon after I have realized that I may have lost the sparkle in my eyes. I am determined to find that fire and pursue it with all my might. My freebies will keep on coming! Sometimes I wake up in the middle of the night and thoughts, random thoughts, start flooding my mind. Last night I started thinking about time. Time has an uncompromising attribute. This hyperactive characteristic can also heal and nourish, when either one’s body or soul is aching. However, sometimes this trait seem rigid and unforgiving. Almost spiteful. 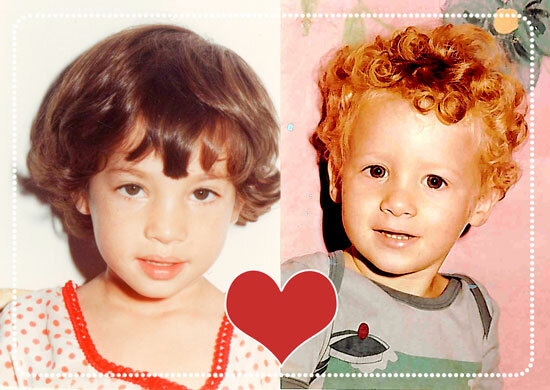 Just a “few” years ago, my husband and I were little kids with dreamy eyes. My husband had bright golden locks and I had soft brown hair. Now we are grown ups. We still have dreams but our dreams are more practical and less fantastical. We rarely think about magic realms anymore. OK, never. Time is just slipping through our fingers. We cannot get a grip on time. We cannot hold on to a moment. We just do our best to exhaust the moment we are in. This is what time is like. What is your take on time? In the left photo you can see my grandma holding her first born, my mother (circa 1948) and on the right you can see me and grandma at the park near her home (circa 1988). 40 years apart – still beautiful. Let me tell you some more about my grandmother. She was born in Poland to an affluent family of merchants and Jewish scholars. Her family was ultra-orthodox, Chassidic. Her parents had 10 children in total. When she was a young adult she started questioning her parents’ Chassidic ways and had secretly joined a more secular Zionist group. She was very careful not to hurt her father’s feelings and would leave home wearing long sleeved shirts and long skirts and then change into more modern apparel and meet with her Zionist friends. Not long afterward she fell in love with a beautiful young student who shared her modern viewpoint and after awhile they got engaged. Sadly, her beloved fiance was caught “in the line of fire” in an outburst against the Jews in the community and was hanged then and there in the center of the neighborhood. She was heartbroken but determined to keep on living. Just a couple years later, WW2 started and Hitler occupied Poland. My grandma remembered the day the Nazis came to her neighborhood and started lining up all the jews. She and her family members ran out into the chilling evening and into the woods. My grandma had blond hair and blue eyes and was well educated [thus fluent in Polish and Russian] so she could pass for a non-jew, which was what had saved her life and prevented her from the destiny of most of her other family members [very unsettling but true]. She took off immediately and ran towards the Russian border, where she was caught as an enemy of the country [being Polish…] and sent to a hard labor camp in Siberia. In Siberia she had to stand all day with light clothes and thin soled shoes and cut trees, in the burning cold (up to minus 40 degrees in the wintertime). She received a portion of 1 coarse loaf of stale bread and 1 cup of water a day and watched hundreds of people give up and die – every single day. 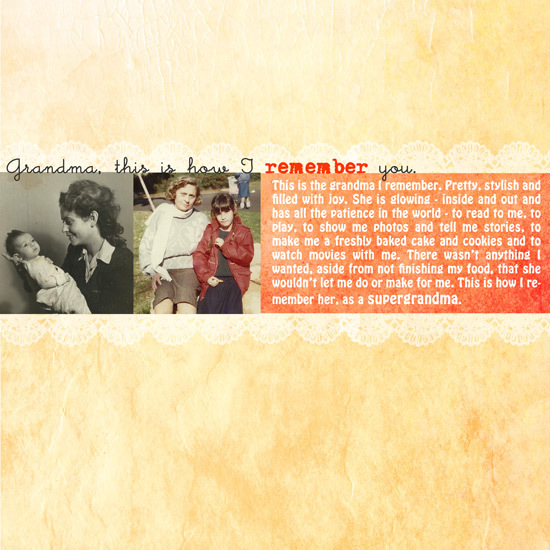 But my grandmother endured until the war was over. Then she came back to Germany and got reunited with her brother. Only 2 brothers had survived the Holocaust (and 1 sister who had left for Israel before the war started and survived as well). In Germany she met my grandfather who had lost his family as well. They fell in love and got married and had my mother while they were still living in Berlin. Thereafter my grandparents left Berlin and came to Israel where they started their own restaurant in downtown Haifa and they had both lived in Haifa until their last day. My grandma was a hard working woman and a survivor. She had strong determination to work as long as she could. My grandma also had the type of charisma that drew people towards her wherever she went and whatever she did. She was a generous person who always loved to host as many guests as possible and prepare noteworthy dinners for everyone. She had led a long, laborious but fulfilling life – a real inspiration to everyone. Thank you so very much for your big and kind heart. I appreciate all your comments and e-mails. They are very comforting in this time of sorrow. I want to reply to each and every one of your heartfelt condolences, but I feel too sad to say anything back. Please do not interpret my silence as neglect. I read each and every comment and take it to heart. Yesterday I came back from a homeland visit and welcoming me back were the news of my grandmother’s passing. In these sad moments I had some comfort in the fact that just the day before I managed to visit her at the hospital and say my mental goodbye. Visiting her was a hard decision for me. I remember my grandmother as a beautiful, beautiful woman, always taking pride in her impeccable appearance. She had beautiful blond hair and big blue-gray eyes. I wish I had some photos with me so I could show you how gorgeous she was. Every picture looks like it was taken on the red carpet in a Hollywood-ian premiere. When I was young she used to take me home from kindergarten and later from school and spend the day with me until my father picked me up in the evening or in the late afternoon. She would go over the yellowing pictures and tell me the stories behind the 2-D photos and then she would start telling me stories she made up or read in Polish and translated for me. Her patience was endless and she kept going and going and never grew tired of telling me all these marvelous stories that I enjoyed so much. I am sure she had contributed to my love of story telling just as much as my parents have. When I was a teenager she got Alzheimer and little by little she grew smaller and smaller until she became just a shadow of her glorious self. In my mind’s eye she was beautiful and glamorous and it was difficult for me to watch her being anything else. At the hospital she was hardly breathing, half comatose. I looked at her and tears started pushing at my eyelids and a big knot started forming in my throat. I could hardly say a word. Watching her shriveled in an impersonal hospital bed broke my heart. Her eyes were partly closed and the light taken out of them. Her big beautiful eyes weren’t glowing anymore. I said “Hello, grandmother” and for a split second I thought she might have heard me. Her eyebrows raised and then dropped again. I tried to touch her, gently, but she pulled back, as if my gentle stroke was hurting her. I wanted to sing to her. I wanted to sing the Polish song she taught me as a child “Zashale Gurale”, but I couldn’t say a word. I just looked at her, silently, and sang it in my heart. Hoping she had somehow heard me. I am glad I had the chance to see my grandmother, just a couple days before her passing but I don’t want to ever remember seeing her like that. For me my grandmother, Gutta, would always be that beautiful lady. Wearing pink lipstick and a fabulous dress or a figure hugging suit, putting to shame the fashionistas on “Mad Men”. For me she would always have light in her eyes and lots of spirit. Telling me stories in half (or quarter…) Hebrew and half Yiddish and Polish (languages that I have never understood). For me she would always be the grandmother who asks me if I want a piece of cake and then making the cake from scratch, just for me. She would always be the grandmother who brings huge jars of scrumptious handmade cookies that disappear in a matter of hours. She would always be that grandmother. For me. I love you, savta. May you rest in peace. Ode To My Coffee. Seriously. O coffee, my coffee, how I love thee. When I am weak you are there to strengthen me. When I am stressed you are there to power me through. O coffee, my coffe, how I love thee. I Have Had A Wonderful Weekend. How Was Yours?